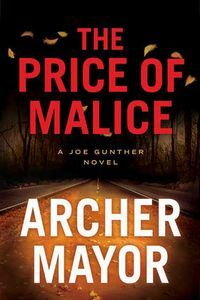 The Price of Malice by Archer Mayor, a Mysterious Review. Review: Vermont Bureau of Investigation agent Joe Gunther is called in to investigate the brutal murder of a suspected child predator, while also helping his girlfriend deal with her grief over the deaths of her father and brother, in The Price of Malice, the 20th mystery in this series by Archer Mayor. The murder of Wayne Castine comes as little surprise to the authorities in Brattleboro. Though he was suspected of being a child predator, and he had a long juvenile record, there was never enough evidence to arrest him as an adult. "It looks like he learned not to get caught after he reached maturity," one of Joe's team tells him. But Joe's investigation of the murder suggests there may be more to the case than the police originally thought. Meanwhile, Lyn Silva, owner of a local bar and Joe's girlfriend, has returned to Boston to care for her ill mother, who has been virtually catatonic since her husband and son, Lyn's father and brother, were lost at sea. In an unexpected twist, however, their boat has been found, housed and undamaged (though repainted) on a private island near the Canadian border. How it got there, however, remains a mystery. Many mysteries frequently have substantial subplots that play out in tandem with the main story, but there seems to be a recent trend in series mysteries to combine two, generally unrelated principal plots, into a single novel; The Price of Malice is an example of this type of book. It's almost as if the author is unsure that one plotline can be sufficiently developed into a full-length novel and thus adds a second one to take up the slack. The result is often disjointed, as it is here. Joe's colleagues are a little miffed that he's spending so much time and effort on what is clearly a personal matter while there's a murder to be solved, and that reaction extends, to some degree, to the reader as well. It is somewhat ironic, then, that the storyline involving Lyn is the more interesting of the two presented, but the least challenging for Joe. Still, as is typical of the series, The Price of Malice is well written with interesting characters, but the concept of merging, or interweaving, what are essentially two independent novellas into one cohesive novel is one that rarely turns out well. Acknowledgment: Minotaur Books provided a copy of The Price of Malice for this review.